Take two hard, small heads of white cabbage and one small head of red cabbage, remove any withered outer leaves and shred the remaining heads finely. Sprinkle the shredded cabbage with a spoonful of salt and let stand. After a short while place the cabbage in a pot and add a cupful of water and a decent portion of goose or pork grease. Slowly boil the cabbage. About one hour before serving, add 3 to 4 good, ripe, peeled apples without the cores, also add - if you have them - some grapes, some sugar and enough vinegar to give the cabbage a mildly sour taste. Shortly before serving the meal add one spoon of flour. Serve as a side dish to cooked or roasted pork, roasted goose or duck, Bratwurst, "Bratwurst"-dumplings, or fried, smoked sausages. From an area of more than 2800 hectares, around 80 million heads of cabbage are harvested each year in Dithmarschen. 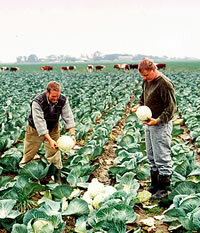 Besides numerous red and white cabbage varieties, savoy cabbage, broccoli and cauliflower are also cultivated. Thus Dithmarschen is the largest continuous cabbage growing area in Europe. The roots of this cabbage growing culture dates back to the early industrialisation in the mid 19th century, when an improvement of transport infrastructure - namely roads and railroads - made it possible to supply far away towns and cities with fresh vegetables from rural, agricultural areas. Even today, the cabbage and sauerkraut production in Dithmarschen is the most abundant in Germany. 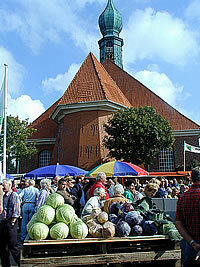 Every September the harvest is celebrated with the annual cabbage festival, the "Kohltage". For one week, information is passed on, entertainment is put on, art is presented, culture is staged and an abundance of tasty cabbage dishes and recipes are offered. The Minister of Agriculture in Schlewsig-Holstein and the County President of Dithmarschen officially open the ceremony with the traditional "cabbage cutting". The Menus of the official festival restaurants attract customers with "Heiermann-Meals" and "3- Thaler/Euro"-Dishes. 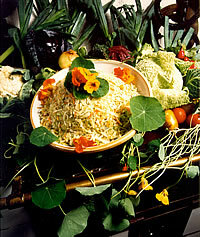 The cooks are always very creative in preparing new and tasty cabbage meals every year. Bus companies, clubs and organisations also offer special services throughout the week: excursions to the Dithmarschen cabbage fields, a roundtrip including lunch on the "Kronprinzenkoog" and "Friedrichskoog" - two impressive polders, a visit to the Kraut factory in Wesselbrunnen and tours of cabbage farmers' storehouses. Two "Cabbage-Sovereigns" accompany the visitors throughout the festivities. These young ladies are true experts in cabbage. As opposed to wine festivals in southern Germany, which always crown "kings" or "queens", the Dithmarschen festival crowns sovereigns. This is because Dithmarschen was always a proud peasant region, where nobility was never able to establish itself. All around Dithmarschen, one can buy cabbage directly from homestead stalls on the cabbage farms throughout the entire year.